This tiny estate, located in the village of Ampuis, consists of 6 hectares (2.5 hectares are within the Côte Rôtie appellation). Prior to 1980, Michel, the father, sold off both his fruit and the wines he produced to the large negoçiant Marcel Guigal. Michel began to bottle wines under his own label, and Bobby's first vintage working with Domaine Ogier was 1988. Nearly 20 years later, Stéphane, his son, is in charge. His youthful energy and passion for the vineyards and winemaking have resulted in the estate's rise to superstar status over the past ten years. Stéphane has been purchasing vineyards on the other side of the Rhône River in Seyssuel, near Vienne. The Viognier de Rosine is produced from these west-facing vines, which average 20 years. As in Côte Rôtie, all of the fruit is hand-harvested then 80% of the wine is fermented and aged in barrel (20% new). The remaining 20% of the fruit is fermented is tank. After seven months the barreled wine is decanted into tank and the 20% tank wine is placed in barrels for one month. 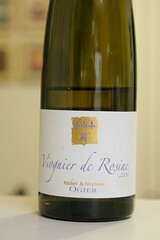 The Viognier de Rosine is a high-toned, delicate, floral wine with wonderful drive, length and complexity. Baby Condrieu!